Okay. 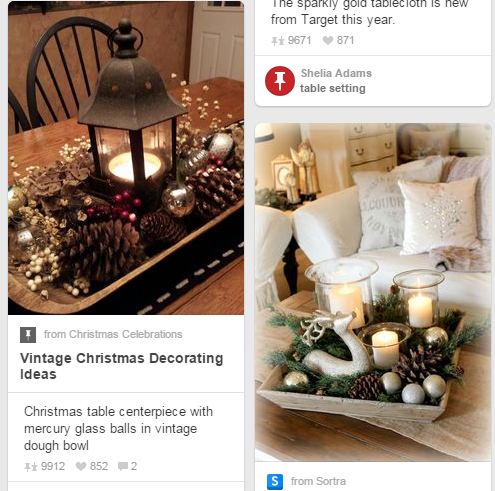 First off, let me tell you how intensely I've longed to have my own place to decorate at Christmastime. Even though I've pretty much handled the Christmas decor at my parents' place for the past ten years or so, they were never my decorations or my house. You know? It's different when it's your stuff and your home. So. I've been stocking up (heh, stocking; how festive) on ornaments and putting back a few random Christmas knick-knacks over the years, saving them in a "Christmas hope chest" of sorts for the future. Well, it's finally the future, and I finally have my own place to decorate!!! Buuuuut in this future, I'm also on a tight, cash-only budget and in the process of defeating our loathsome, life-controlling, $74,000 debt. It's funny. If we hadn't had that financial wake-up call thanks to Dave Ramsey earlier this year, I would have been excitedly swiping the plastic right now, buying every Pinterest-worthy, rustic-and-cozy-yet-chic, piece of Christmas cheer I came across. I'm incredibly thankful for that fact, because I'd be digging an even deeper hole right now. But at the same time, this Christmas is kind of a big deal. It's my first Christmas in my own place. It's exactly one year since Matt proposed. It's my first Christmas as a married adult. It's our first Christmas. And hey, it's my first Christmas with a good-paying job. I want to go all out with it, decorating like crazy, getting gifts for everybody. Like Oprah. And, well, I just can't. Matt and I talked about it. 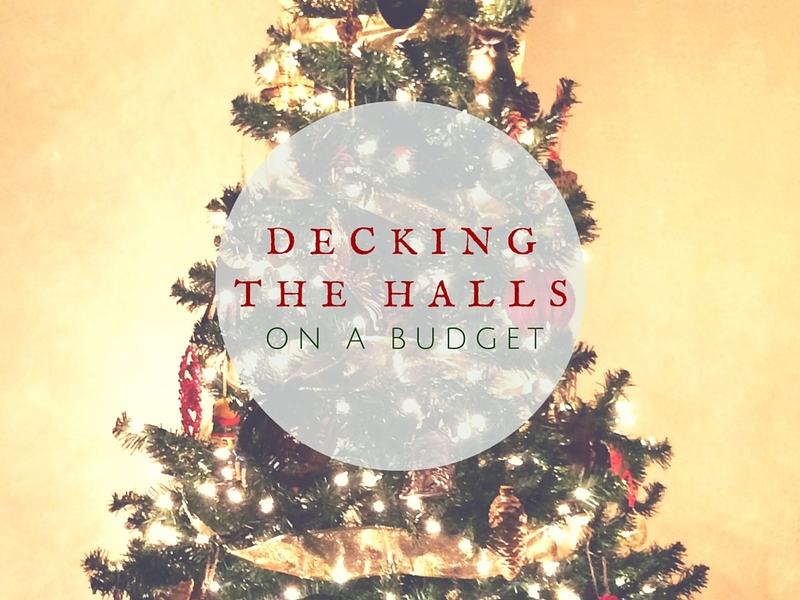 We looked at our budget and decided we could set aside $100 to spend on Christmas decorations and mailing cards. After a quick price-checking trip to Hobby Lobby, that seemed like an impossible challenge, but I had no choice but to meet it. Thankfully, my mother-in-law gave us her old pre-lit tree for free when we moved. That cut out a huge expense for us. And as I said, we already had collected quite a few ornaments over the years. What we still "needed": tinsel/ribbon, tree topper, tree skirt, and decorative picks to fill in the unavoidable holes that come with an artificial tree. I shopped everywhere in town. I couldn't find a decent star or angel topper for under $15. Not even at Walmart. So I didn't get one. 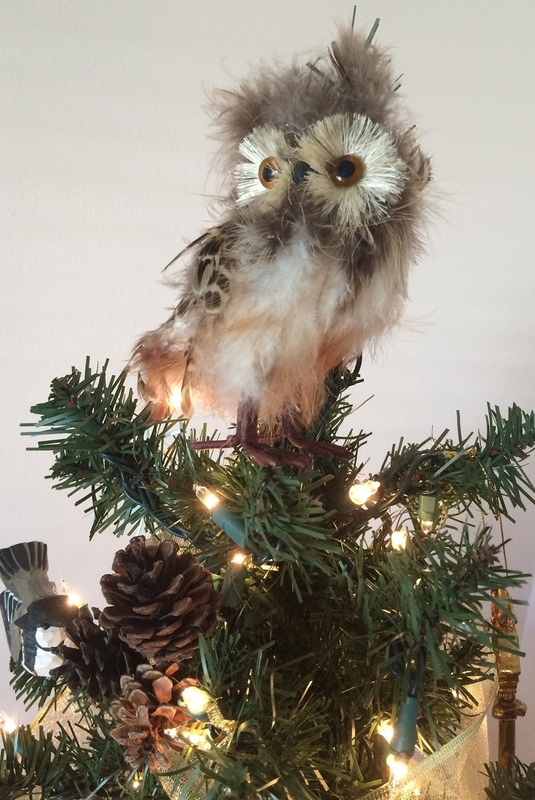 Instead, we just put this giant owl ornament Matt had received as a gift a year or two ago atop the tree. It's a little questionable, I suppose. I mean, we honestly just stuck it up there as a joke at first. But it looked pretty good, so we left it. It goes with the tree's overall theme and fits our style as a couple well. And uh...it was free. Michael's just so happened to be having a huge Christmas decor sale on our weekend off. I mean, one-day-only, 80% off. We already needed to go to Columbia for other things, so we made Michael's one of our destinations. We hit the jackpot. Their ribbon was marked down super cheap- the huge spool of 3" wired gold ribbon I got was less than $4. They also had these really cute, natural-looking pine cone picks on sale for about $0.60 a piece. We hated to pay for pine cones, but there aren't pine trees in this part of the country (makes me sad), and we thought that would be the perfect decorative filler for our tree. Take a look at how it turned out. The ornament we bought on our honeymoon! A nice detail of pine cones and ribbon, too. We got Cedar, the lumberjack, at Target for $3. Had to. 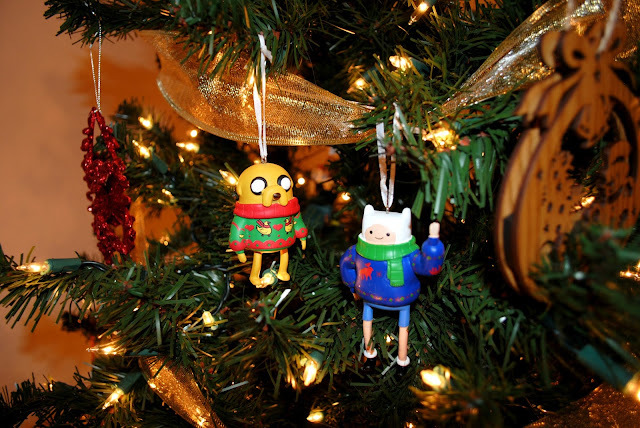 The Adventure Time ornaments I gave Matt on Christmas Eve 2014, the night before he proposed! The other tree-related expense was the tree skirt. Holy crap, have you shopped for tree skirts lately?!? Everything I liked was upwards of $35! Determined to not give in, we cheaped out big time and got a fleece blanket for $6.88 at Walmart. Maybe we can get a fancy one next year, but for now, it totally works. Annie approves. This being the first multi-level home either of us have lived in, Matt and I both wanted a garland for the handrail. I know, it's kind of silly, but we just did. We found a short (9 ft, I think) plain pine garland at Target for $3.98. Around it, we wrapped some gold beads we also got at Target for $1 and some of the leftover gold ribbon from Michaels, then stuck a few of the pine cone picks in, along with some faux poinsettias I got at Michael's (it was a single bunch of about 7 for $2 that I cut up). Another shockingly expensive Christmas "must-have"? Stockings. 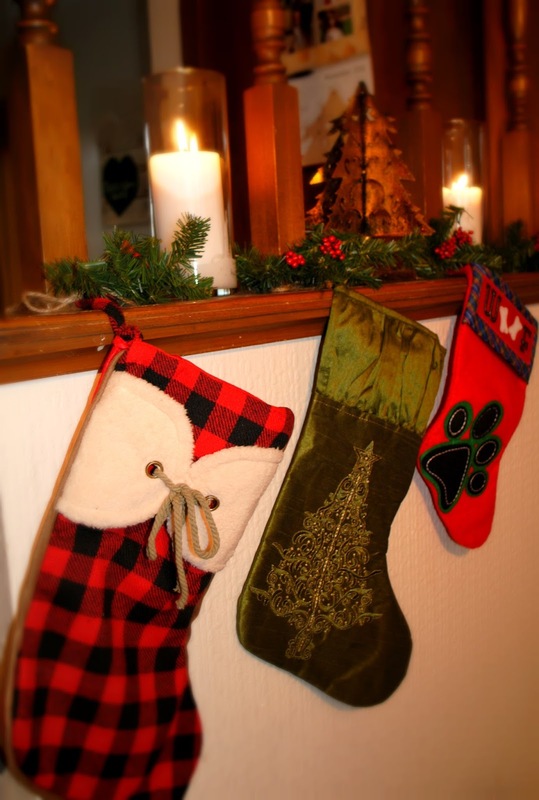 Luckily, Hobby Lobby had their stockings 50%, so we paid $15 for all three of them (yes, Annie has her own stocking.). The stocking holders were, like the tree skirt, another expense I just couldn't get past. I wasn't gonna shuck out $10 each for a cheap piece of metal to hold our stockings. So, I improvised. I worked with our balusters (I think that's what they're called...). I looped some twine (which we already had) around them and tied them tightly and neatly through the stocking hangers. It didn't look bad like that, but to gussy it up a bit, I snipped a few sprigs off that 9 ft pine garland from Target, pulled out some of the candles we had onstage at our wedding, went through my craft supplies until I found the artificial berries I bought for some homemade holiday candles last year, and made this little display. 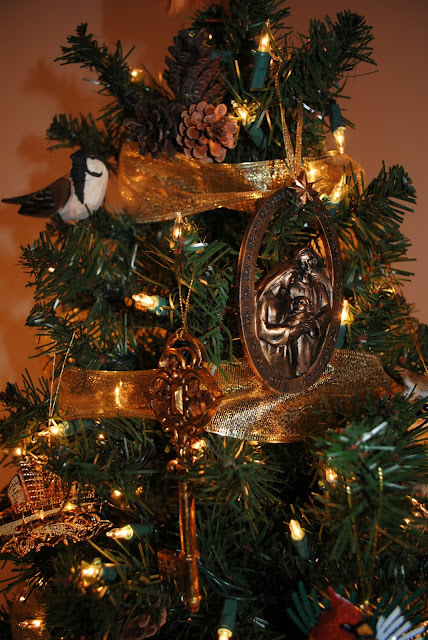 The gold Christmas tree in the center is a Hobby Lobby special that I bought for my office at work a few years ago. Pretty savvy, huh? 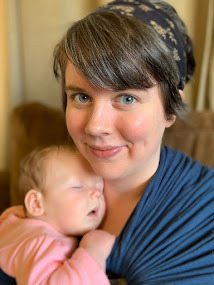 The next two are kind of cheating, because I already had them in my "Christmas hope chest": a pine cone wreath and gold snowflake from Hobby Lobby. Also already had the pup. To spread a little Christmas magic to our dining room table, I hit up the Dollar General for some $3 snowflake place mats. 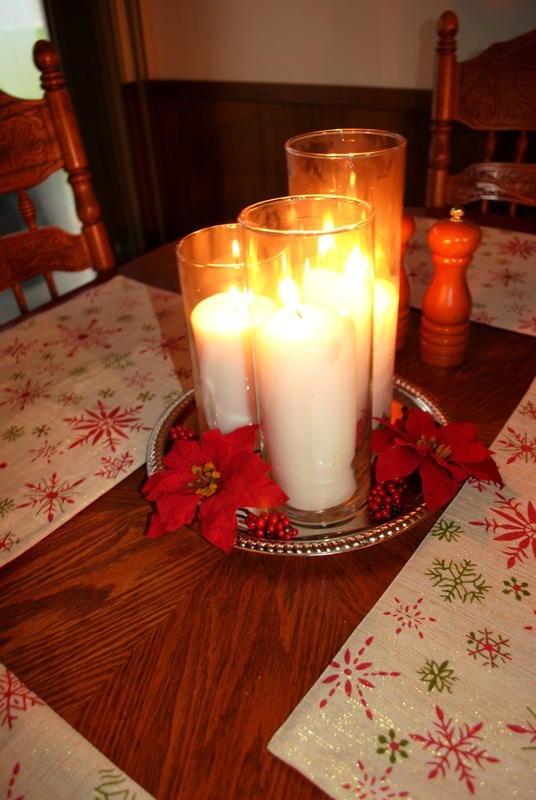 I wanted to do some kind of centerpiece as well, and after seeing all those leftover wedding candles in the basement, I grabbed three more of them, fetched a Dollar Tree serving tray from the kitchen, and simply placed a few leftover artificial berries and poinsettias around the candles. 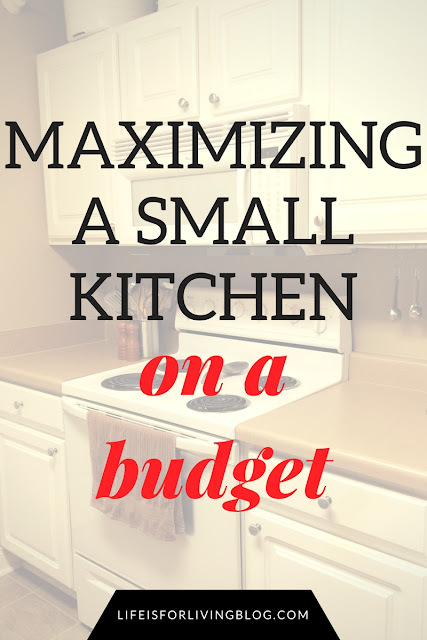 So inexpensive, easy, and pretty. I wanted to do something similar on our coffee table. This lantern was one of several that lined the aisle at our wedding. The silver tray was another Dollar Tree purchase for some party of yesteryear. The pine cones were from picks stolen from a few spots on the tree that didn't really need them, the berries were from the craft box, and the pine sprigs were cautiously snipped from the hand rail pine garland. Talk about stretching your dollar. I think Matt was starting to worry that there would be nothing left of the garland on the stairs. But it worked out beautifully. This little centerpiece makes me really happy. But what makes me even happier? All in all, the grand total spent on our decorations comes to about $49.00. Not even kidding. How are you saving money this Christmas? 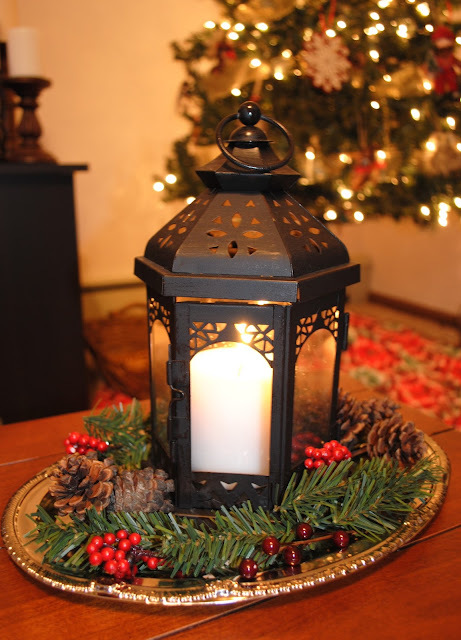 Feel free to share links to pics of your own Christmas decorations; I love creeping other people's homes! I was so happy to see this post and your Thanksgiving one. Your decorations are beautiful and no one would ever know how little you spent. Except of course, that you told the world on your blog, haha. The little owl tree topper is actually pretty cute, and the fleece blanket as a tree skirt is nice, too. I have also been shocked at the price of tree skirts, even cheap looking ugly ones can be pricey. 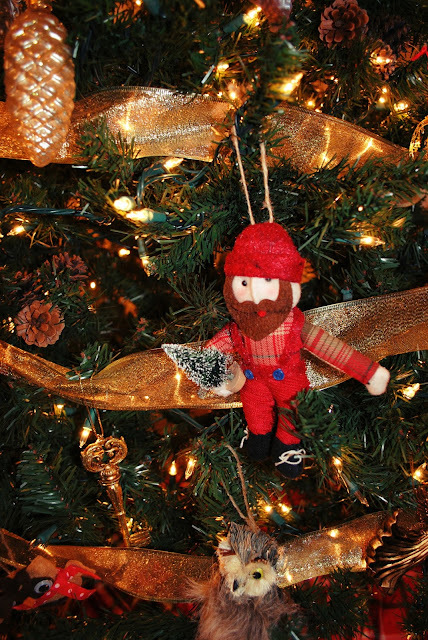 The lumberjack ornament make me crack up. If I had seen the thing I'd have probably bought it for you. I love the photos of the three of you. Your Thanksgiving food looks amazing!! I wish I could have eaten a few of those rolls. Happy holidays! I miss you.